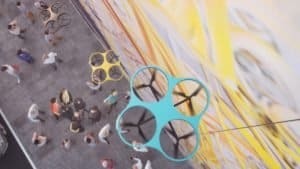 Dezeen recently released a short documentary setting out how drones could revolutionize the way people travel, transform how buildings are designed and built, and radically alter the form cities take. Called Elevation, the 18-minute movie explores the impact autonomous flying vehicles will have on our lives, and discusses both the positive and negative implications of a future when drones are as “ubiquitous as pigeons”. 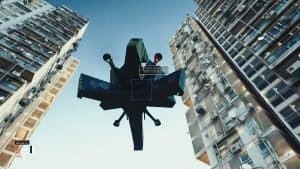 “What we’re seeing now that drones are in the hands of every person on the street, they’re potentially as disruptive as the internet,” says speculative architect Liam Young, one of the many leading drone experts interviewed exclusively for the movie. 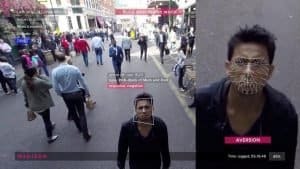 Other figures interviewed in the film include architect Norman Foster, founder of Foster + Partners, Anab Jain of design studio Superflux, and transportation designer Paul Priestman of PriestmanGoode. 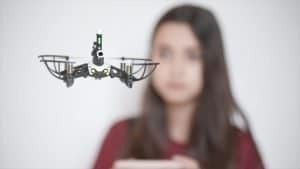 “Ten or 15 years ago, drones were immensely expensive, complex objects, and now you can just buy them at a toy shop,” says Priestman. A year in the making, Elevation is the first documentary to explore the impact of drones. It brings together for the first time real footage of drones delivering packages, laying bricks and performing complex and repetitive tasks such as checking infrastructure and spraying fields. 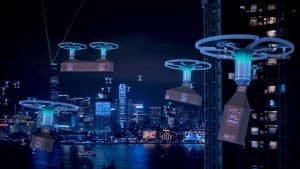 The documentary also presents futuristic scenarios showing how swarms of unmanned aerial vehicles, or UAVs, could relieve congestion on roads, and transport both goods and people. 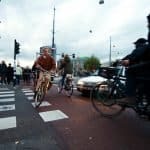 As urban transportation moves from the ground into the air, the entire way cities expand could be overturned. Priestman compares the potential impact to that of the first railways, which allowed cities to expand dramatically along these new linear routes. 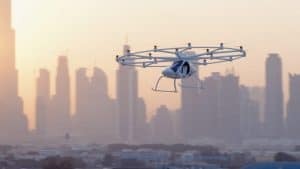 “I think with flying autonomous vehicles there could be an equally big step change in cities because we’re not bound by linear infrastructure, because you can fly wherever,” says Priestman. 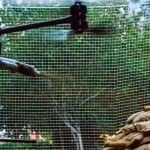 Architect Mark Dytham believes that buildings will have to change to accommodate drones, which will be so numerous they will swarm like a “cloud of wasps” in the urban skies. Dytham says his architecture firm, Klein Dytham Architecture, is already working with clients whose briefs are changing thanks to UAVs. Elevation contains computer-generated sequences showing swarms of “Dragonfly” drones delivering items direct to people’s balconies, created by PriestmanGoode to explain the potential of the technology. 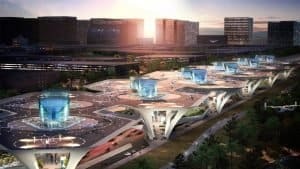 It also includes footage showing how drones could transport people, including clips from Uber’s recent Skyport initiative exploring how its proposed flying taxis could herald new forms of architecture. Elevation also discusses the impact of drones on the construction industry, presenting recent experiments where drones are used to lay bricks to create structures or weave cables to manufacture a bridge. 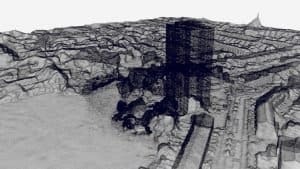 “I believe there will be a huge impact on the built environment once we actually start using these machines in construction,” says Ammar Mirjan, a researcher at Gramazio Kohler Research at ETH Zurich who worked on a project exploring aerial construction. 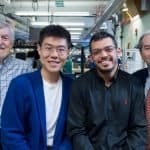 “Flying robots provide access to three-dimensional space in entirely new ways for architecture,” says Mirjan. 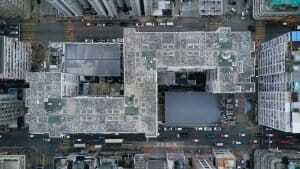 “Architects are using drones, some of them are using them to actually build buildings,” says Hans Ulrich Obrist, artistic director at Serpentine Galleries, who points to other unexpected uses of UAVs. “Others like Carlo Ratti are using drones to paint facades, to basically do large scale paintings, because all of a sudden a very large facade of a building which used to be very complicated and needed scaffolding becomes very easy because the drone becomes the brush,” he continues. 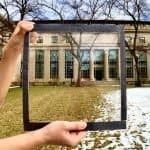 Architectural photographer Ed Reeve, who uses camera drones to shoot buildings, believes the technology is transforming the way architecture is perceived. The elevated viewpoint people can experience through drones is changing our perception of the world, according to figures in the film. This freedom is potentially liberating and democratising, since cheap drones give ordinary people the same power as authorities. “Before the power was in the hands of the police, but now a crowd can launch a bunch of drones in the air and document police violence, or they can make people accountable,” says Liam Young. Affordable drones are also a powerful tool for architects and designers. “Day to day we use a drone a lot,” says Dytham, who carries a small, folding camera drone with him at all times and uses it to survey sites and inspect progress on projects. Designer Clemens Weisshaar, co-founder of Kram/Weisshaar, uses drones to quickly scan locations, capturing vast amounts of data quickly. However this ability to fly anywhere, to see the world from any viewpoint and to record information unchecked has potentially dark implications. Privacy is one area where drones will have a profound impact, she says. The potential to use drones for destructive purposes is also raised in the film. 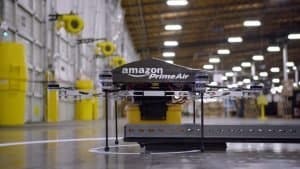 “It’s surprising how little has happened with commercially available drones that you buy on Amazon, because there is stuff that can carry considerable payloads,” says Weisshaar. “There’s been a lot of near misses at airports. But also just dropping things into a crowd is a real option, it’s a real option. And gladly nothing has happened there yet, but it will,” he says. 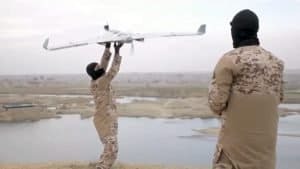 Elevation contains footage of ISIS fighters launching home-made drones that drop bombs, and a shocking sequence of a pistol strapped to a drone that fires shots remotely. “The reason why we’re having this conversation now, where everyone is talking about the drone now is because it’s now got to the point where that technology has become democratised because they’re now in the hands of everybody,” says Liam Young, concluding the movie. Elevation was conceived and produced by Dezeen’s in-house video studio and was directed by Marcus Fairs and Oliver Manzi. It had its world premiere at Public in New York on 20 May 2018. Further screenings are taking place in Venice and London this week, with many more scheduled around the world over the coming weeks. Producers were Ben Hobson and Calum Lindsay, editing was by Oliver Manzi, with camera and motion graphics by Miguel Santa Clara. Sebastian Jordahn was production assistant. Music is by Donato Dozzy and sound design and mix is by Mikkel H. Eriksen of Instrument Studio. The 90-second trailer for Elevation was launched in Hong Kong in March. UK culture secretary Matt Hancock described the trailer as “mind-blowing”.